Presidential aspirants of the Convention Peoples Party (CPP) have condemned the Mahama-led government for engaging the International Monetary Fund (IMF) with the aim of trying to revive the ailing economy. The three-year IMF bail-out is expected to come with stringent conditions such as job cuts in the public service in order to reduce the wage bill as well as a cap on the amount of loans Ghana can contract with the public debt now hovering around GH¢65billion (almost 60 per cent of GDP ratio). 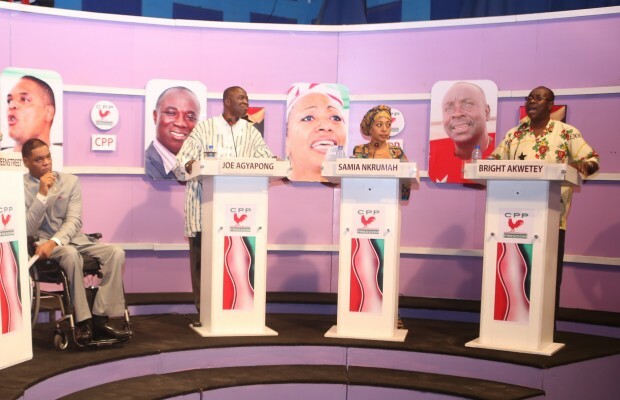 Speaking at the maiden edition of the debate organized for presidential aspirants of the CPP at the TV Africa studios in Accra on Tuesday, Samia Nkrumah, one of four of the presidential aspirants stated that by accepting the conditions imposed by the IMF, it was clear that the current government did not believe in the dignity of Ghanaians. Samia Nkrumah is in the race with Ivor Greenstreet, former General Secretary of the CPP; Bright Akwetey and Joseph Agyapong. One of them would be given the mandate to lead the party in the 2016 elections at the CPP presidential primaries on Saturday. “It is very clear to all of us that the conditions imposed by the IMF are simply not working. The system has failed completely and it is very obvious that if you had a government that believed in the dignity of the people, there is no way you are going to accept these conditions,” Samia said. She said government should be able to stand up to the stringent conditions attached to the lMF bail-out just like the CPP did in the 60’s. “I want to see the day when we are confident enough to be able to say no or to say enough is enough when certain proposals are brought to us. Give the CPP a second chance to run this country and you will see the difference. We are able to say no, not because we are stubborn or rigid but because we have our own economic plan that can cater for the needs of the people of Ghana. What we need is our economic independence. Fellow Ghanaians, this is what we have to do and this is what we have to do soon and with a sense of urgency before things get very difficult,” she added. Joe Agyapong wondered why the current government kept running back to the IMF and agreeing on conditions that were clearly not helping our economy. “We have come to know that taking money from the IMF is not helping this nation; it is rather destroying this nation by the day. A lot of people are unemployed because of this IMF conditions. We cannot keep doing this everyday,” Mr Agyapong noted. However, Bright Akwetey called for the criminalization of galamsey and the creation of state-owned industries to help drive away the IMF. “We need to stop exporting our raw materials like gold and our oil and add more value to it before we export. If we want to wean Ghana off the IMF prescription, we need to take control of our economy and be self-reliant. We need to control employment to generate taxes. If we do not localize control over our resources, we will live to regret it,” Mr Akwetey said. Mr Akwetey, who is aspiring for the third time (after 2008 and 2012) to lead the CPP as presidential candidate, said if CPP was given the nod, he would fight corruption with an iron fist with the help of the anti-corruption institutions in the country. “I would also fight corruption with an iron fist. In fighting corruption, I would go back to the anti-corruption institutions. The previously called Serious Fraud Office, now EOCO has been emasculated by not being provided enough facilities, opportunities and the funding to carry out their work,” he said. He argued that the creation of the Ghana Youth Employment and Entrepreneurial Development Agency (GYEEDA) and Savannah Accelerated Development Authority (SADA) among others were palliatives which do not solve the alarming unemployment rate. The event, which was moderated by Prof. Kwame Kakari, brought together a host of CPP faithful to support the aspirants.